Please visit our Amazon page to purchase the book. We Take Electric Power for Granted. Threats to Our Electric Grid are Real. Here’s How to Prepare. Powering Through is an action guide and contains, for the first time, a comparison of critical infrastructures that can suffer long duration outages caused by five high impact threats: high altitude Electromagnetic Pulse (HEMP); solar geomagnetic storms; cyber-attacks; physical attacks; and Radio Frequency (RF) weapons. We are accustomed to short duration power failures. However, disruptions of weeks, months, or over a year are more and more possible, yet this risk is largely unrecognized. The book examines the interdependent, and critical, infrastructures that would be threatened by a sustained electric grid failure, such as our water and wastewater systems, communications, transportation, emergency and healthcare services, government and military defense, to name only a few. Importantly, the book concentrates on consequence management, starting at the individual, household, and community levels of preparedness. If we are better prepared at home, we can better assist the organizations that will lead recovery, whatever the challenges. In addition, the book sets out a plan for forming resilient community islands which can ultimately aid in recovery. Ultimately, Powering Through offers hope, via thorough and concrete expert advice, not just to individuals, but to local, state and federal government, emergency organizations, and others, that they can prepare for this very real threat to our electric grid. And what’s more, this book heralds a call to action for these same groups to begin preparing NOW. 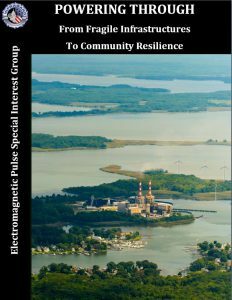 Chapter II Power Grids and Interdependencies Composition and importance of the grid; complex dependencies and interdependencies and other U.S. Critical Infrastructure Sectors; grid vulnerabilities; projections relating to cascading and catastrophic impacts of long-duration grid failures. Please use the form below only to be informed of future publications. Pre-orders will no longer be accepted through this method. Thank you.